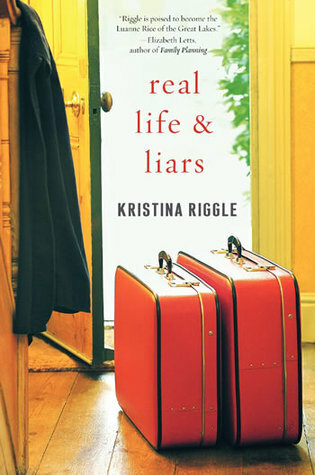 I borrowed this book from the library.... Real Life & Liars by Kristina Riggle. According to goodreads: "Sometimes you find happiness where, and when, you least expect it. For Mirabelle Zielinski's children, happiness always seems to be just out of reach. Her polished oldest daughter, Katya, clings to a stale marriage with a workaholic husband and three spoiled children. Her son, Ivan, so creative, is a down-in-the-dumps songwriter with the worst taste in women. And the "baby," impulsive Irina, who lives life on a whim, is now reluctantly pregnant and hitched to a man who is twice her age. On the weekend of their parents' anniversary party, lies will be revealed, hearts will be broken...but love will also be found. And the biggest shock may come from Mirabelle herself, because she has a secret that will change everything." I really enjoyed this book. It was written from several different perspectives which made for an interesting read. Overall a good book. 3.5 out of 5. To me it still looked like a large walk in closet. 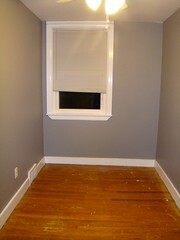 Well last week, we had carpet installed. 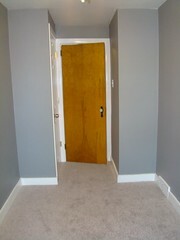 I was quite nervous about the carpet color choice. 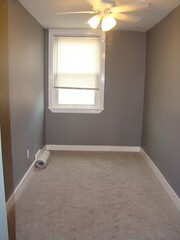 We opted for a light gray carpet to go with out slightly darker gray walls. 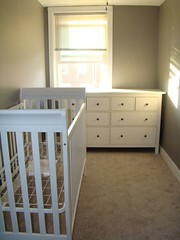 That left our nursery looking like, well, a nursery. 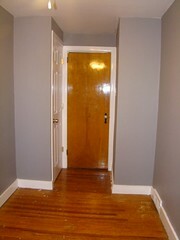 I was still skeptical of the carpet color, but onward and upward we went. My mom and sister we visiting last weekend, so we headed out for some furniture shopping. First stop, Ikea for a dresser. Remember, upon my dad finding out he was going to be a Grandpa, his first response was "So I have to buy a crib?" 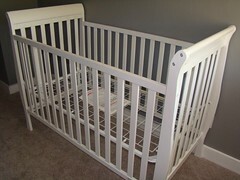 Well Baby Rudiger, thanks his Grandpa for the new crib. 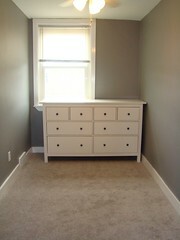 I still need to play around with room configurations and fitting a chair and bookcase in the room. I think I have a plan. Watch for more updates soon.